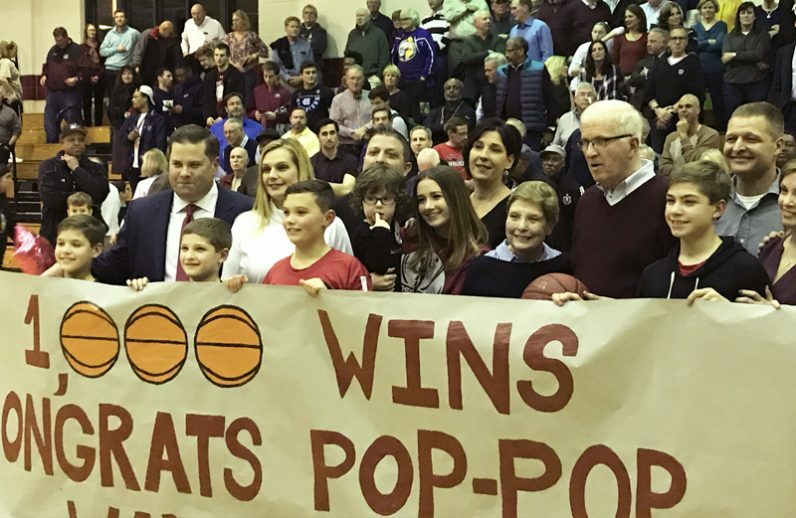 That’s precisely what St. Joseph’s Prep basketball coach Bill “Speedy” Morris experienced Friday afternoon, Jan. 12. Before and after the Prep’s impressive 63-42 triumph over visiting Lansdale Catholic, Morris was besieged by congratulatory mobs from literally every different angle. 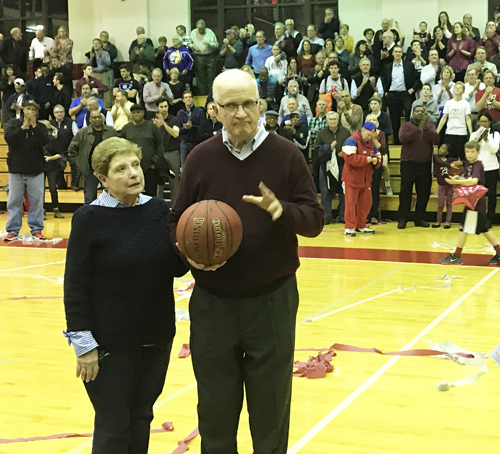 Family, friends, former players, former assistant coaches, Prep faithful and longtime Catholic League fans enveloped the Prep’s standing-room-only Kelly Fieldhouse to pay homage to a man who has coached at every level for five decades and, thanks to the win over Lansdale Catholic, 1,000 combined high school and college victories. After the victory, Morris returned to his small office, surrounded by wall-to-wall pictures and mementos. A man who shuns limelight and lives by the adage that actions trump words, Morris appeared extremely content, a tad fatigued and significantly relieved that Speedy Morris Day, which included television coverage, was finally over. That Morris has lived a very, very blessed life was crystal clear. At every turn, someone from his past insisted on a handshake, hug, or picture, or all three. His countenance strongly suggested that he didn’t mind. Those who know him best would tell you that he would much rather have simply focused on getting his team prepared to play the Crusaders, but avoiding the spotlight would have been an exercise in futility. So Morris went with it. 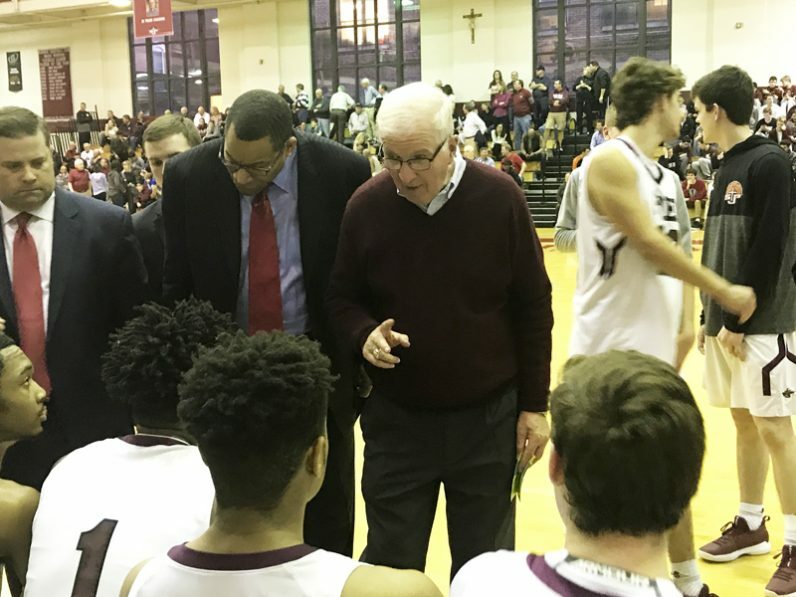 “When you think about his legacy and how it has impacted others and continues to impact others, he is truly one of the great Philadelphians of our time,” said John Griffin, the former St. Joseph’s University coach who starred for Morris before graduating from Roman Catholic in 1974, and the father of current Roman coach and Prep 2007 alum Matt Griffin, like his father a first-team All-Catholic under Morris. “He is also one of the great Catholics of our time, and I say that seriously. A lifetime worshipper at St. John the Baptist Church in Manayunk and a daily communicant, Morris coached CYO basketball at his grade school alma mater during his senior year at Roman Catholic, from which he graduated in 1960. He would eventually inherit the varsity Roman Catholic job in 1967 and ultimately lead the Cahillites to six of their 30 Catholic League titles while accruing a dazzling record of 347-82. Morris would later coach at Penn Charter High School and then at La Salle University, first as women’s coach and then as men’s coach. He took over the Prep in 2001 and led the Hawks to back-to-back championships in 2003-2004. But on this afternoon, wins and titles were secondary. This was a celebration of a life well lived, a life that remains vibrant, passionate and strong. One guy that didn’t mind the commotion at all was senior Darius Kinnel. Late in the second quarter, Kinnel drove to the hoop for a highlight reel layup, which gave him 1,000 career points. The game was temporarily stopped and Kinnel received his own well-earned fanfare. Morris offered Kinnel quite a compliment. In an interview with CatholicPhilly.com, Jim O’Brien, current assistant coach for the Philadelphia 76ers and former NBA head coach who played for Morris at Roman Catholic before graduating in 1970, called Morris an iconic figure. Carl Arrigale, the current coach at Neumann-Goretti who played for Morris at Penn Charter, attended the game despite having to coach his own game a few hours later in South Philly. Ironically, the coach he would compete against later that evening, the aforementioned Matt Griffin, was also on hand. Steve Vasturia, the all-time leading scorer in Prep history and former University of Notre Dame standout, said it was an “honor” to play for Morris. As the post-game buzz subsided and family and close friends (and a reporter or two) hovered around the hallway outside Morris’ office, Chris Cmiel, a fifth-grade student at St. Genevieve School in Flourtown and one of Speedy and Mimi Morris’ eight grandchildren, was asked what words come to mind that best describe his grandfather. Congratulations, Coach Morris! What an awesome accomplishment! Many of the basketball skills that I teach my son, Thomas, and his friends are the same ones that I learned from Speedy when I was a player on the Penn Charter basketball teams in the 1980’s. Coach Morris, thank you for being the great teacher and coach that you are! My son Darius Kinnel chose St. Joseph’s Prep because of Speedy Morris. He attended one of his camps as a 7th grader and could tell what a warm human being that God had bestowed upon earth. It has been his pleasure and honor to have been coached by such a kind person. After meeting his family, it gives my son a role model for how he will conduct his life. What an honor!